Just beautiful outfit! You look stunning! Such a pretty and unique skirt! I love these photos and the skirt is just amazing. That tiered skirt is quite a gem! This skirt is absolutely stunning! The details and colors are just simply stunning! Also, loving your hair straight- not used to seeing it this way but it looks gorg on you! that skirt is incredible, and so unique! that skirt is so unique! love the texture!! i love your superstar necklace! Love the colors of the skirt! Beautiful look! You find the most amazing skirts! Well jell! You look stunning! love the skirt and the sunglasses! Love the color on that skirt! such a lovely skirt! looking gorgeous! OH EM GEE.....LOOOOOOOOOOVE this skirt! you look SO pretty. Love the skirt! Is very original and cute. Love your hair in this. The dress seems very summery! Such a gorgeous skirt Krystal, one of my fave pieces! What an interesting dress. Beautiful. the texture of the skirt is incredible! This is one of my favorite looks from you lately! That skirt is awesome! That skirt is kind of insane...in the best way possible. Love this entire look! You always have the best clothes! I love the skirt! what a fun skirt. You look great! This skirt is gorgeous !!!! Your skirt makes me think of these beauties... Very cute outfit!! 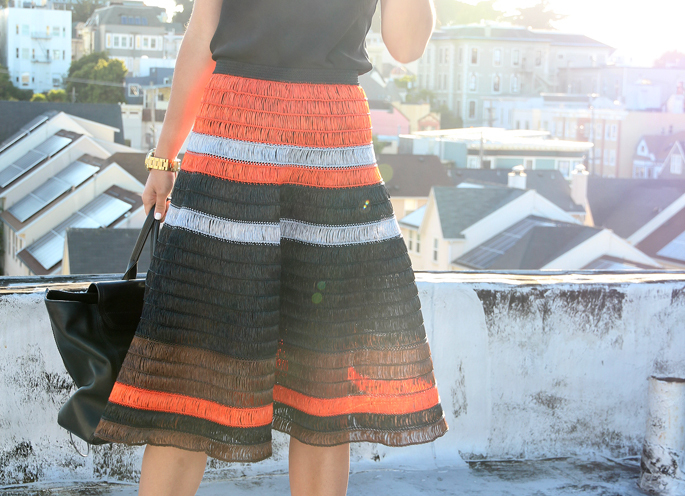 I definitely love this Proenza Shouler skirt ! the material on that skirt is so unique! the skirt reminds me of the harley davidson logo...totally biker babe outfit!